This is a replica of the old Zion Lutheran Church which was originally located about two miles south of New Haven, WV in the community of Broad Run. It was the first Lutheran Church west of the Allegheny mountains, and it was one of the older churches in the area. A group of Lutherans from the Shenandoah valley moved into the community around 1800. They were German Lutherans whose forefathers had come directly from Germany. These families included the Roushes, the Weavers and others. The Zion Lutheran Congregation was organized in 1806 and for a while they met in private homes. 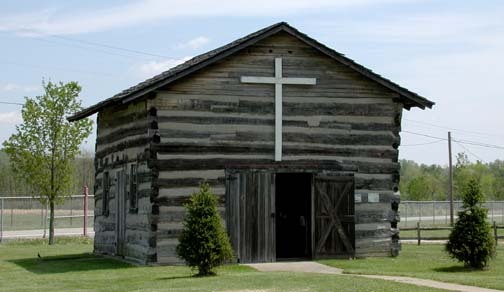 In 1815 Daniel Roush donated a tract of land and the congregation built the old log church. Other congregations were also organized at the old church. In 1832 immigrants of the Presbyterian Faith came to Point Pleasant and used the old log church and in 1834 a congregation of United Brethren moved into the community and used the church. The old log church was used from about 1815 to 1895. Due to the deteriorated state of the original logs the church had to be rebuilt from architect's drawings and old pictures. Indian raids were always a threat during the early 1800s and the original church was built with a balcony and no windows and only one door for protection. In order to accommodate tour groups an extra door and windows were added to the rebuilt church at the farm museum. The old log church is still used for services during festivals and special events.